Depression is a disease of the mind, body, and spirit. It has the potential to impact all areas of your life — emotions, relationships, physical health, work, and productivity. The good news is that depression is very treatable; with proper mental health treatment, most people can effectively manage their depression. One of the struggles in treating depression is that the symptoms of depression (such as low energy, hopelessness, or insomnia) make it hard to do the things that will make you feel better. 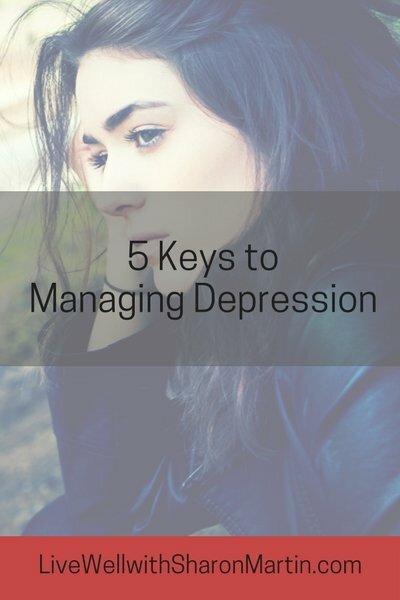 HARMS is an acronym that I use to remind my clients of the 5 key areas to attend to in managing depression. They are health, activity, relationships, mind, and spirit. Depression affects your physical body with symptoms such as fatigue, insomnia, muscle aches or headaches, so it’s important to give your body some extra TLC. This includes eating reasonably healthy, avoiding caffeine, alcohol and other mood altering substances, trying to go to sleep and wake up at the same time every day, exercise, attending to personal hygiene, and taking medication or supplements as prescribed. Activity doesn’t necessarily have to be “exercise”. Activity just means moving your body more. It can be dancing around your kitchen, taking the stairs instead of the elevator, or walking out to get the mail. Try to get up and get out of the house daily. If you’re not very active, try adding five minutes of activity to start. Remember that getting started is often the hardest part and being active leads to more activity. Do you isolate yourself when you’re depressed? This is another common symptom of depression. When you feel miserable and like no one cares about you, it’s hard to pick up the phone and call a friend. However, it’s very helpful to spend time around positive people. Push yourself just a little to spend time with people you like, perhaps eat dinner with your family. Try to say “hello”, make eye contact, even practice smiling at strangers. Our minds are actually not very accurate. Our survival instincts scan for danger and focus on the negatives; this is a remnant of our primitive brain that doesn’t serve us very well in modern society when we’re generally not in great physical danger. When we’re depressed we’re particularly susceptible to negative and distorted thoughts that support our feelings of depression, hopelessness, and self-loathing. Distorted thoughts tend to be very convincing, automatic, and pessimistic. They aren’t accurate reflections of reality; they’re reflections of your depression. Therefore, it’s important to identify them, challenge their validity, and replace erroneous thoughts with accurate ones. You can find more information on distorted thoughts here and ways to challenge them here. In this context, the spirit or soul refers to the non-physical aspects of us — passion, meaning, energy, consciousness, life-force. Your physical body needs nourishment and so does your spirit. What brings you joy and fills up your spirit or soul? It could be a hobby, music, prayer, meditation, or art. Think about what made you feel good in the past and give it a try. Don’t expect it to be joyful right away. Depression zaps the happiness out of even the most pleasurable activities, but you can gradually bring some of it back with practice. Utilizing the five components of HARMS (health, activity, relationships, mind, and spirit) can be a helpful way to remember and take actions that help you manage depression naturally. It’s always important to follow your doctor’s or mental health professional’s advice and immediately seek help if you’re feeling suicidal or like hurting yourself. You can access 24/7 help at 1-800-273-8255 by phone or chat. You can also download a PDF copy of the HARMS approach to naturally manage depression, as well as 30+ other worksheets, journaling prompts, and other resources to support good mental health, by joining my newsletter below. ⟵Perfectionism and OCD: What’s the Difference?